Samsung has started rolling out another OTA update to the Galaxy Note 5. 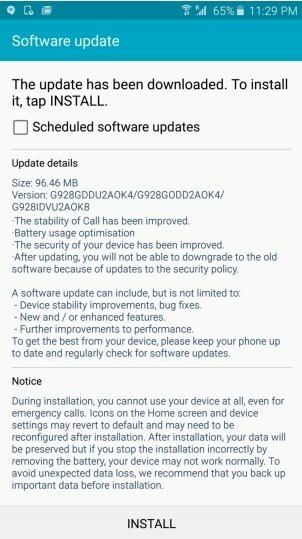 As reminder, the Note 5 received the first software update in October. The new update size at around 100MB ant the build number is N920GUBU2AOK3. The new feature in this is similar to the previous update, which generally delivered stability, battery optimizations, and also improvements related to the security of the device. The stability of Call has been improved. The security of your device has been improved. If you haven’t received a notification, make sure to head into the Settings » About device » Software update menu on your device and hit the Update now button to rectify that.